On the eve of the 50th Anniversary of the formation of Creedence Clearwater Revival in 2018, Members of Boy & Bear, All Our Exes Live In Texas, Hot Spoke and The Whitlams have reinterpreted a hand-picked selection of enduring Creedence classics, rendered in a mesmeric mix of acoustica and indie folk. Vocal duties are shared between Katie Wighton (All Our Exes) and Ness Quinn (Hot Spoke) who deliver a haunting and intoxicating take on the traditional Fogerty originals. 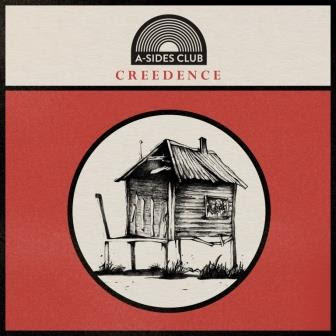 A-Sides Club is rounded out by David Symes (Bass, Boy & Bear), Jak Housden (Guitar, The Whitlams), Stuart Hunter (Keys, Passenger) and Evan Mannell (Drums). During a three week period at Forbes St Studios, Sydney in July-August 2017, the 13 tracks were committed to record – amounting in a beautifully cohesive set of recordings boasting innovative arrangements and cinematic delivery. The album was produced by David Symes and mixed by Wayne Connolly. CREEDENCE & AUSTRALIA: It’s a fact many people forget; Creedence Clearwater Revival’s 1970 album (their fifth) ‘Cosmo’s Factory’ spent an astonishing 19 weeks atop the Australian Charts, parking itself at the head of the list of best-selling albums from September 1970 to January 1971 (knocking off Simon & Garfunkel ‘Bridge Over Troubled Water’ and replaced by no less than Led Zeppelin ‘III’). That legacy of enduring popularity in Australia consistently shines through in streams, downloads, chart positions, sales and radio airplay. Double A Side: Long As I Can See The Light / Have You Ever Seen The Rain? | Streaming worldwide now. October 27th: I Put A Spell On You. November 3rd: Bad Moon Rising. November 10th: Who’ll Stop The Rain?